Three tales of how First 5 LA is making a difference. If you made a New Year’s resolution last month – including the vow to eat healthier – there’s an 80 percent chance that you gave up by mid-February. Yet while some people merely “talk the talk” when it comes to changing their eating habits, many Best Start Community Partnership members are walking the walk – not just for themselves, but for their communities. 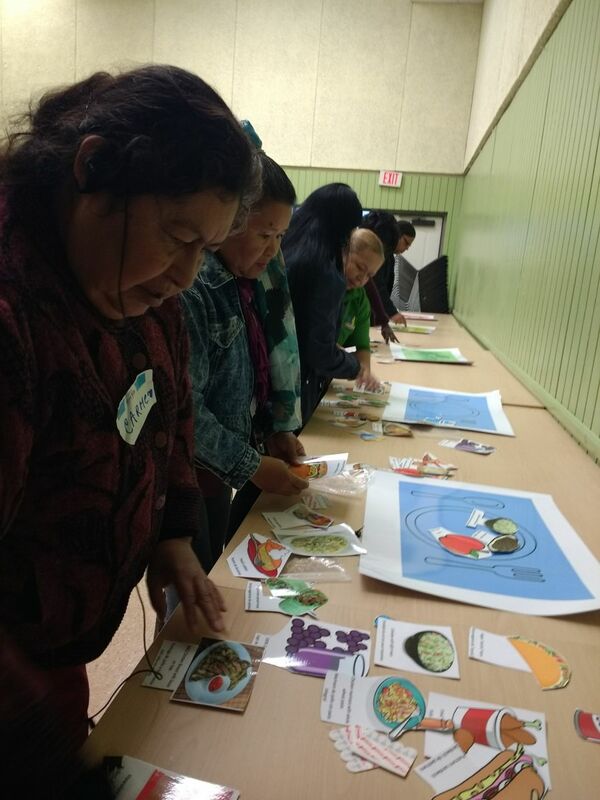 A member of Best Start Watts-Willowbrook Community Partnership, Martinez joined with 30 other representatives from the 14 First 5 LA-funded Best Start Community Partnerships to create the first Healthy Food Guidelines (HFGs) for their partnership meetings and beyond. First 5 LA serves food at close to 50 community meetings per month across the 14 Best Start Communities and at onsite convenings. Working with the Los Angeles Food Policy Council, First 5 LA and Best Start partnership members began meeting last fall to establish the guidelines as a tool to educate Best Start members in their communities on nutrition and use First 5 LA’s purchasing power to ensure that healthy food options are served at these meetings. Research reveals that healthy nutrition habits are associated with longer life expectancy, lower risk of preventable chronic disease and improved academic performance. Yet nearly all Best StartCommunities are located in what are called “food deserts” – low-income communities with a lack of grocery stores, farmers’ markets and other healthy food retail outlets. As a result, many in these communities suffer from disproportionate rates of poor nutrition and food-related disease, such as obesity and diabetes. For example, 40 percent of children in the Antelope Valley (where the Palmdale and Lancaster Best Start Communities are located) drink at least one sugar-sweetened beverage a day – nearly three times the rate for children in the more affluent community of West Los Angeles. So it’s no surprise that the number of adults in the Antelope Valley with diabetes – (14.5 percent) is three times the number of adults with diabetes in West L.A (4.5 percent). And just this week, a new analysis of federal data revealed that childhood obesity in children ages 2 to 5 nationwide increased at an alarming rate – from 9 percent in 1999 to 14 percent in 2016. Best Start representatives who participated in the creation of the guidelines will further the process by working to broaden healthy eating habits back at their own partnership meetings. In addition to sharing the new guidelines, they may survey partnership members about their health challenges and dietary needs, require food vendors to sign a healthy food pledge, seek out educational opportunities, conduct supermarket tours and offer healthy food cooking demonstrations. 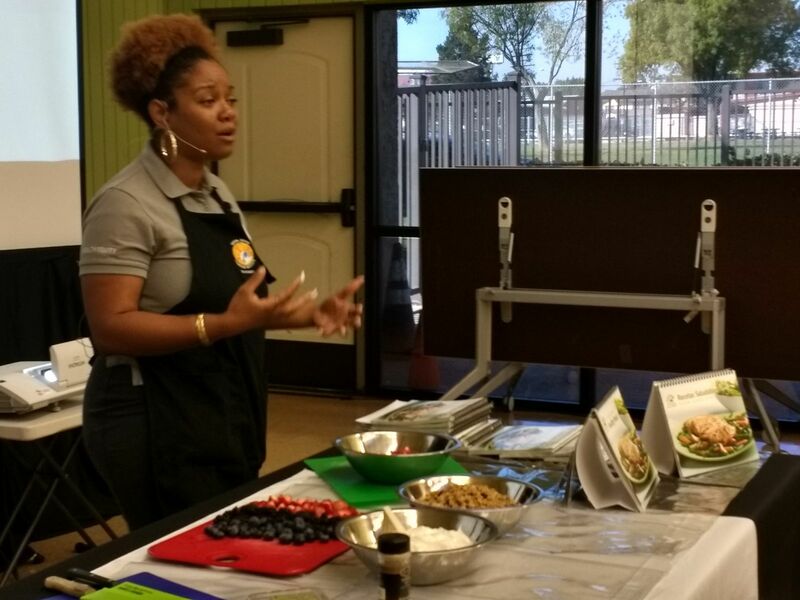 One such demonstration occurred at the February 9 gathering, where Social Justice Learning Institute Health Equity Program Manager Nicole Steele showed Best Start representatives how to create a quick, nutritious yogurt and fruit parfait for breakfast before sending their children off to school. “This parfait makes sure they eat healthy for breakfast so they can stay alert at school,” Steele said. Involving children in the preparation of nutritious meals, she said, can help them “feel invested” in what they eat, as well as provide the opportunity to educate them about the health benefits. Children’s eating behaviors and choices are strongly influenced by their home environment. Research shows, for example, that children’s consumption of fruits and vegetables correlates with their parents’ consumption levels. It was not only Best Start representatives who learned something new while creating the guidelines, either. “It was a great learning experience for us on the power of having community involvement on developing these standards,” said LA Food Policy Council Director of Policy Breanna Hawkins. Moving forward, many Best Startrepresentatives’ plates will be full promoting the vision of healthy eating habits in their communities. Several said they would like to advocate for healthy food options at local markets, child care centers, schools and eateries. This advocacy effort reflects First 5 LA’s Built Environments strategy, whereBest Start members can be a part of the work to improve the built environments in their neighborhoods. A community’s physical or “built environment” includes access to healthy food, the condition of housing and schools, safety of its streets and parks and other environmental factors that act as barometers of residents’ health. In other words, access to nutritious food is all part of the recipe to help give young children the best start in life. Did you hear the one about the little boy who couldn’t wait to get back to the dentist? After 4-year-old Itzae bit into a chicken taco at dinner in January, he felt a stab of pain that made him stop chewing on the right side of his mouth. When his mother, Samantha, called the dentist in Pomona the next morning, the last thing she expected was being told to get off her smartphone . . .
. . . and take a picture of her son’s mouth. Samantha had called the Western University of Health Sciences College of Dental Medicine (Western U CDM) Village School Linked Oral Health Center, where registered dental assistant Alexis Maldonado utilized a web-based application, DentaCom™ — created by Corey Stein, a fourth-year dental student at Western U CDM — to virtually triage dental emergencies. After uploading the photos of Itzae’s mouth, the boy was brought in for a same day appointment. 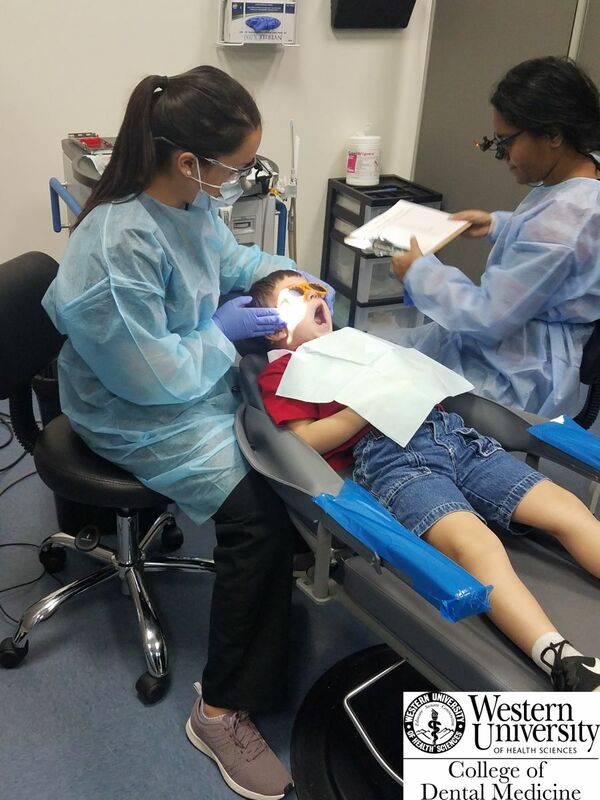 And despite it being his first visit to the dentist, Samantha said “he was very comfortable.” The boy colored a Pikachu drawing, listened closely as Dr. Marisa Watanabe explained his x-rays, and asked questions about the “sugar bugs” that were causing him pain. 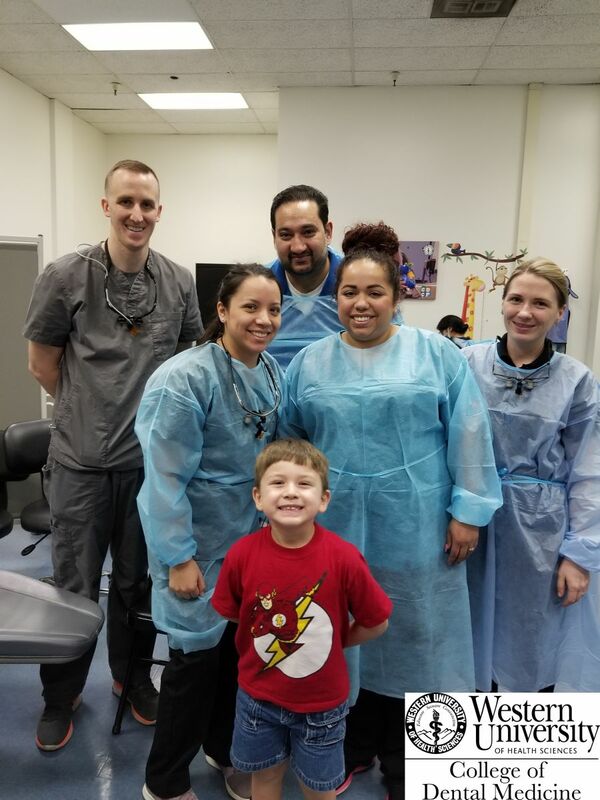 Not only did he put on a brave face for his mother while Dr. Watanabe “scooped out the sugar bugs”, Itzae proudly left with a toy octopus – and an appreciation for tooth care. “He flosses twice a day and brushes three times a day,” said Samantha, who has taken Itzae back for additional dental work following a comprehensive evaluation. Itzae’s story is just one of the tens of thousands of young children who have received dental care in Los Angeles County through First 5 LA’s Children’s Dental Care Program (CDCP). In July 2012, the First 5 LA Commission approved $38 million to fund the CDCP with three strategic partners: WesternU CDM, the Herman Ostrow School of Dentistry at USC, and the UCLA School of Dentistry. The goal of First 5 LA’s CDCP was to provide oral health services and improve oral health status for at least 95,000 children ages 0-5 in Los Angeles County over a five-year period beginning March 1, 2013. The need was critical. According to a 2009 study funded in part by First 5 LA, some 72 percent of children under age 5 in L.A. County's low-income communities had untreated cavities – more than double the national average among youngsters in comparable age and income groups. And research documented by the First 5 Association of California revealed that nearly 1.7 million children age 5 and younger enrolled in Medi-Cal in 2013 and 63 percent of those children did not have a dental visit over the previous year. The program delivered far more smiles than expected: an additional 30,000 children were served during the five-year period, bringing the total to 125,000. USC trained over 2,000 health care providers about the importance of oral health and educated over 35,400 caregivers, including community and family members, about the importance of oral health for their children. UCLA expanded their First 5 LA 21st Century Community Dental Homes Model Project to 10 community clinics to serve as quality dental homes for children 0-5 and pregnant women. Western U CDM developed partnerships and infrastructure to continue and enhance pre- and post-doctoral training for dental and primary care providers serving children ages 0-5 years, forming new partnerships in four school districts, three hospitals and nine Women, Infants and Children (WIC) sites across communities to expand oral health services to young children. And while First 5 LA’s involvement in the CDCP is sunsetting – with funding expiring for all three partners by this summer – the project has helped usher in a new dawn in oral health care for young children not only in L.A. County, but statewide, as well. As an example, Ficek pointed to the state’s five-year Dental Transformation Initiative (DTI) that began in 2016, which includes a total of $740 million entirely focused on improving dental care for Medi-Cal children. First 5 Association of California Executive Director Moira Kenney echoed the impact of innovative oral health initiatives on statewide systems change. “First 5's approach – testing innovative ideas and bringing them to scale through partnerships at the state level – has resulted in many of California’s most important expansions in oral health care, from the virtual dental home to training of providers to serve very young children with special health care needs,” Kenney said. Josih Hostetler, director of Community Outreach at Western U CDM, also credited the partnerships and infrastructure created through the First 5 LA CDCP to obtain federal funding that will benefit more children in the future. “Thanks, in-part, to these relationships and infrastructure, WesternU CDM received a $1.499 million Health Resources and Services Administration (HRSA) grant to train pre-doctoral dental students in providing care to vulnerable children ages 0-5 and children with special health care needs in rural and underserved areas,” Hostetler said. Dentists, too, are touting the benefits of participating in First 5 LA’s CDCP program. Fortunately, the legacy of First 5 LA’s CDCP will live on in the smiles of young children like Itzae. Diagnosed at birth with a heart condition requiring an oxygen tank and special feeding instructions, Bryan was barely a month old when he came to St. John’s Well Child and Family Center in early 2017. His parents were overwhelmed: their baby needed heart surgery and multiple specialist appointments. As the mother, Jessica, had no transportation, that duty fell on the father, Odiz, who was already working overtime to keep the family afloat. The added demands of shuttling his son to these appointments during work hours threatened his job security. 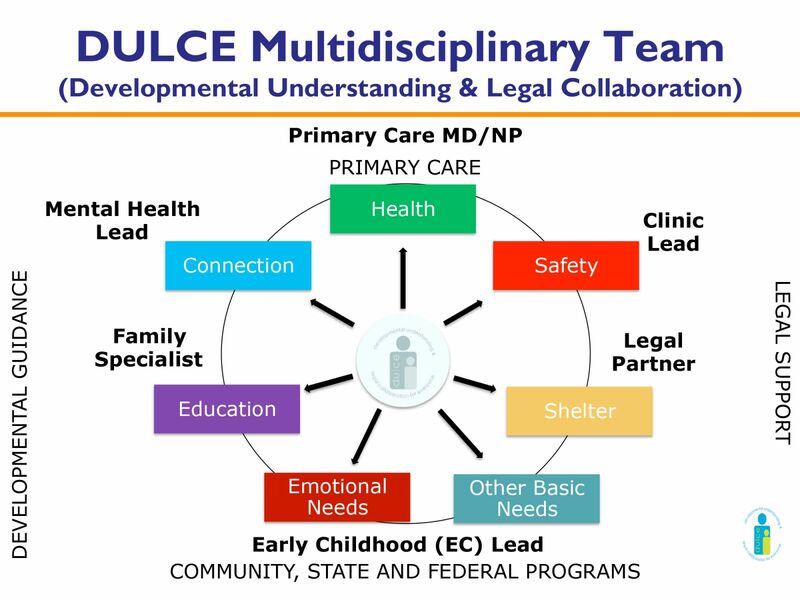 Enter Project DULCE (Developmental Understanding and Legal Collaboration for Everyone), an innovative pediatric care-based intervention that employs a multidisciplinary team to address toxic stress in families, identify a family’s unique needs – including nutrition, housing and legal issues – and sets families up for success by relationship building in the medical and resource communities. As one of three community clinics participating in Project DULCE in a Los Angeles County pilot funded by First 5 LA in partnership with the Center for the Study of Social Policy, St. John’s was able to link Bryan’s parents to a trained family specialist. During the six-month program, a Project DULCE family specialist enhances well baby checkups at the health center, shares child growth and development tools with the family, works with the multidisciplinary team to develop a support plan for the family and promotes the family’s ability to navigate the health system and advocate for the needs of their child. “Project DULCE intends to reduce toxic stress in newborns and their families and optimize healthy child development.” -Jocelyn V. Ramirez. In the months leading up to surgery, family specialist Cynthia Garcia provided donations of baby essentials and equipment, interfaced with St. John’s medical staff during Bryan’s checkups, and collaborated with the behavioral and legal specialists on the Project DULCE multidisciplinary team to assist the family in acquiring Supplemental Security Income (SSI) benefits and resources from the South Central Los Angeles Regional Center. All the while, Garcia helped support Jessica and Odiz through the fear and stress of their baby’s upcoming surgery. The surgery was successful and, in July, the family graduated from Project DULCE. Today, more than a year later, Bryan has celebrated his first birthday and is no longer reliant on an oxygen tank. And even though Bryan will have to undergo a second surgery at age 3, his parents are grateful. The SSI benefits have helped the family financially during his follow-up care and leading up to his next surgery.